You know the story of when I first learned how to make keychains right? Do I have to go back down memory lane again? Oh alright, you twisted my arm. When I was about 7 or 8 years old, I could be wrong on the particular age, my parents would buy us kids crafts to keep us busy. We learned latch hook so we would make rugs that would end up on the wall for a very brief moment before they disappeared and nobody ever wondered where they went, or at least I didn’t anyway. I went into the Cub Scouts at age 9 and that was when I learned to make the keychains, but the very simple box one. I couldn’t even make the circular ones yet. I certainly didn’t know how to finish them because we would end up lighting the ends on fire and they would turn black. That was a hazard for a 9 year old to play with fire and to squash the burning plastic with their fingers lol. I also learned plastic canvas crafts while in the Cub Scouts and I learned how to tie dye a t-shirt at Salvation Army band camp when I was 12. When I was 17 I learned to make friendship bracelets and when I was 18 I learned to crochet, knit and embroider. Since then my craft has certainly evolved, unfortunately so has the pain which caused carpal tunnel syndrome. I have my good days and bad days, but mainly I just work on the keychains and earrings whenever I get the chance. 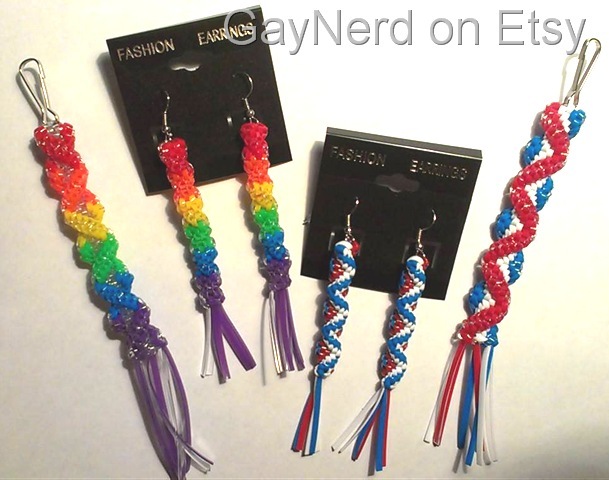 I started making the Rainbow DNA plastic lanyard earrings recently based on the actual keychains of which I have even made several different styles and color combinations. I was looking at a keychain and thinking, this would look great on an earring, but on a smaller scale, and here I am now. The 2nd pair of earrings that I made are a bit more patriotic to match the patriotic DNA lanyard keychain that I have made. So I’m having fun making them and really, isn’t that what life is all about? Doing what you love and having fun doing it. I think it is. I love the keychains, and I just adore the earrings to match and I think you will too. So check them out and let me know how you like them. The keychains are $3.50, the earrings are $5 and the shipping is $2.00 and .25 cents for each additional item in your order. My Etsy shop is called GayNerd.